In 1857 a group of Jewish Merchants in the town of Shasta formed the Hebrew Benevolent Society, whose main purpose was to see to the proper burial of Jewish miners in accordance to Jewish customs. 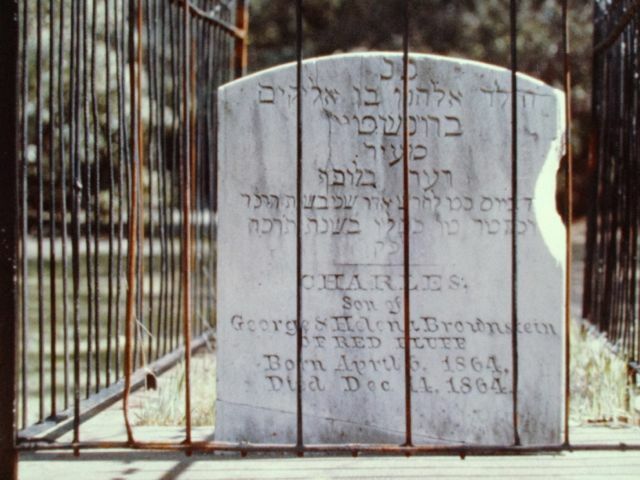 In 1864 the Brownsteins of Red Bluff lost their 8-month-old son, Charles. 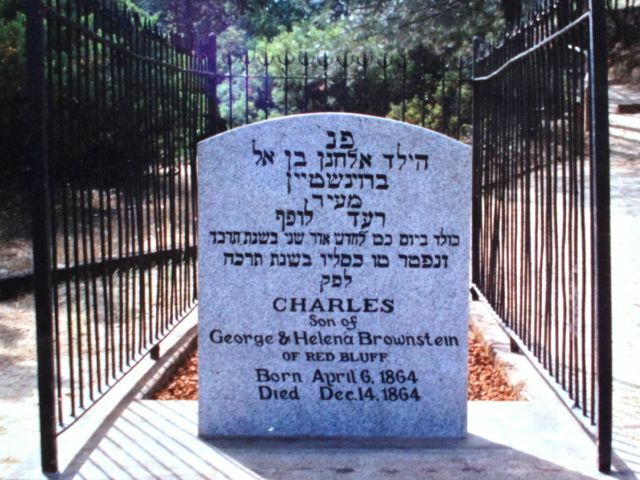 As the Jewish cemetery in Shasta was the only one for hundreds of miles they made the two-day trek by wagon to inter their infant son in consecrated ground. In 1923, a highway crew working on improving what would later become Hwy 299, discovered the grave. The engineers built the road around it with traffic flowing by on either side. In 1933 once again the highway needed to be widened so the Shasta Historical Society declared the grave a pioneer monument and it is designated a state historical site. The road is widened to the south of it. In 1946 the road is widened again, this time moving it to the north of the grave. Over time, with few Jews in the area, the gravesite is neglected. Then, in 1976 the Redding Jewish Community Center is established. The members meet occasionally at the gravesite for services and to help with maintenance of the area. Due to its proximity to the highway, the grave is the target of occasional vandalism. During the summer of 1988, the headstone is broken off from its base and stolen. Shasta County Secret Witness puts up $300 for information about the headstone and it is soon recovered. Due to the damage incurred in removing the headstone, and the effects of 120 years of weathering on the lettering, the conservator at the Redding Museum of Art recommends replacing it. Lawncrest Chapel donates a new stone and Moss Lumber donates wood for steps and railing which will lead to the gravesite. Boy Scout Troop 125 helps with the project. On June 10, 1989, a dedication ceremony is held. One year later the local E Campus Vitus chapter offers to underwrite the cost of a state historical landmark plaque, and in July 1990 it is dedicated. 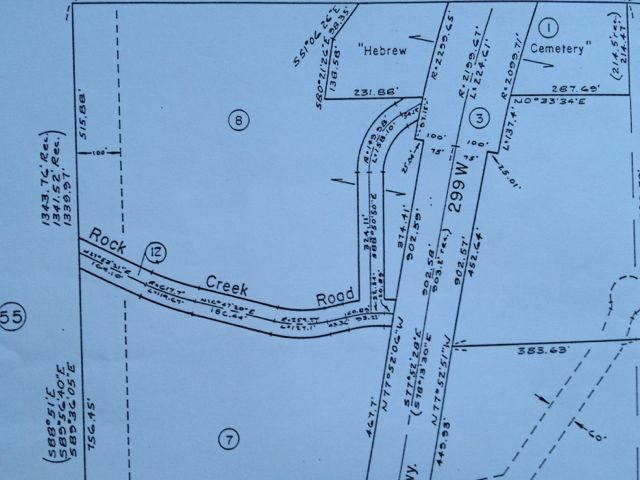 In 1985, the Shasta County Board of Supervisors grant CBI a deed to 3 1/2 acres of land just east of the Baby’s Grave that has been on the books at the County Recorder’s office since 1872 as belonging to the Hebrew Congregation of Shasta. It is the land designated as the Hebrew Cemetery. Unfortunately, the current highway bisects the property, but we hope at some point to establish a cemetery of our own there.